Whether you call it special education or exceptional education, your expectations for its role in your child’s life are high, as well they should be. As parents of special needs students, we face decisions that parents of typical students rarely consider. Public, private, or charter school? Consider homeschooling? Individualized Education Program (IEP) or 504 plan? Standard diploma track or certificate of achievement? Independent learning or one-on-one assistance? Standard or alternate state assessments? Graduate at 18 or participate in transitional job-training program through age 22? It can be exhausting. Personally, we chose to homeschool our son. We did so until age 10 when the perils of puberty possessed our once compliant and sweet little man and made him a hormone-crazed cyclone of meltdowns, defiance, and tears, the latter expressed by us and his siblings mostly. At that point, and after prayerful consideration of what was best for both him and the rest of our family, we chose to enroll him in school outside of our home. Initially, we tried public school. The school we were zoned for did not have an Exceptional Student Education (ESE) program at all. After contacting our district’s liaison and arranging for an initial IEP, we were assigned to a school on the other side of town that had an established ESE program. The problem was, as can be said about all children on the autism spectrum, if you have met one child with autism, you have met one child with autism, and Jeremiah is quite the enigma! Jeremiah is verbal, though he often speaks what we like to call “Jeremese,” a language only those closest to him can translate. He can follow directions with no more than two steps. He has likes and dislikes and interests and obsessions. From the outside, he looks like most typical kids. Developmentally, however, Jeremiah averages about four to six years younger than his actual age. To date, he is 16-years-old, and while he loves Avengers like most 16-year-old boys, he still loves Paw Patrol and silly songs by Jack Hartmann. Educationally, he has only just mastered single-digit addition and counting to 100. His reading level is lower still with most words he knows being sight words he has memorized. In other words, there was no cookie-cutter classroom for Jeremiah in the public school setting. He was too big to be in with the kindergarteners or first-graders, though that was educationally where he should have been placed. Instead, he was placed in a classroom with nine other ESE students of various ages and developmental levels, eight of whom were completely non-verbal. Needless to say, it was not long before he began acting out behaviorally and regressing developmentally. After two six-hour school days spent sitting at the edge of the principal’s desk coloring alphabet worksheets as the teacher lacked knowing what to do with him, we made the decision to bring him back home. We persevered in homeschooling him for another year and a half. Then we tried a charter school specifically for kids on the autism spectrum for a year and a half and three years at a private school for kids with varying disabilities. Throughout those nearly five years I have been witness to “teachers” with no college degree at all, let alone one in the education of children, being placed in classrooms merely to fill positions. The result of one such case was two different families filing complaints with the Department of Children and Families for physical abuse against a gentleman who before he was hired as a special needs educator, parked cars for a vehicle rental company. That man naturally lost his job at the school, but after what irreparable damage to those he was supposed to teach, nurture, and protect? I have seen fire codes for maximum numbers of persons in a dwelling being broken and OSHA regulations on the number of bathrooms per student ratio being ignored for the sake of a few extra tuitions collected. I have seen book and assessment fees charged with no textbooks distributed or annual testing administered. I have even heard of scholarship funds being fraudulently charged for services not rendered. As special needs parents, we have worries and stresses that come with raising our children with physical and developmental eccentricities that parents of typical children do not have. We worry about insurance co-pays and deductibles for the myriad of specialists and therapies. We worry about futures, guardianship as they age, special needs trusts, and who will care for our babies after we are no longer here for them. We don’t sit and ponder who they will marry someday or about the grandchildren they will have for us to spoil. Instead, we strive to teach them basic self-care and life skills so that they can make gains towards the independence that so many of us take for granted. With all of these worries and stresses, we should not have to add to those that our children are in unsafe environments with unqualified people who do not have their best interests at heart when they are at school. Our hands are not tied. There are proactive things we can do as parents to ensure that our kids’ educational goals are being met. Those goals? To learn all that they can in the capacity that they can to ensure that they are as successful and independent as they can be and in an environment that is both structured and nurturing. So what can and should you do to ensure your exceptional needs student receives the education he/she deserves, that his/her typical peers receive? 1. Have regularly scheduled meetings with your child’s teacher or team to review progress or areas of concern. You don’t have to wait for the annual IEP meetings either! 2. Be present and actively involved in all IEP meetings. 3. If you feel your child would be better served with a one-on-one aide to help him/her excel in the public or charter school classroom, request one be assigned. Public and charter schools typically receive extra funding for students with IEP’s. While they are fond of receiving those funds, they are not often fond of spending them, but they receive them to offset the extra services required to meet your child’s needs. 4. The law requires public schools to educate students in the least restrictive environment possible. That means that they are to required to include your child in general education environments with other non-disabled students whenever possible. If they believe that your child would best be served in an actual classroom reserved for exceptional education, they must prove that they would be unsuccessful elsewhere. 5. ALL states are now required to have a three dispute-resolution process at the state’s Department of Education level if a parent’s attempts to resolve conflicts within his/her child’s school district fails. 6. You can invoke the “Stay Put” law if a district would like to expel your child or change his/her placement because of behavior problems. If it is determined by the IEP team that the behavior is a manifestation of his or her disability, your child cannot be expelled from school. 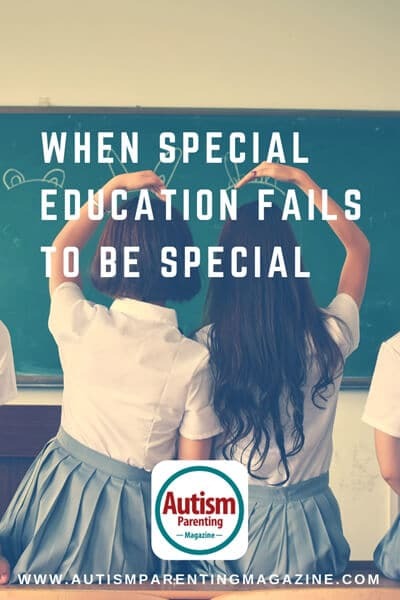 If your child’s behavior is not a manifestation of his/her disability, your child may be suspended or even placed in an alternative education program or facility, but the district must continue to provide his/her special education services. 7. Familiarize yourself with the Individuals with Disabilities Education Act (IDEA). Your child’s education may be limited by how educated you are about his/her rights as an exceptional needs student. 8. Beware that, if you choose to send your child to a private school for your own personal preference, academic reasons, or religious convictions, you do not keep any protections under IDEA. Only if the private school accepts federal funds of any kind, including scholarship funds specifically for students with exceptional needs, must they still abide by the Americans with Disabilities Act and Section 504 of the Rehabilitation Act. 9. If your child’s private school receives scholarship funding for his/her tuition, know the guidelines and responsibilities by which they receive that funding. They are accountable to follow those guidelines in order to receive those funds. 10. If you feel uncomfortable confronting your child’s school and team in regards to his/her plan and services in place for your child, there are special needs advocates or attorneys you can hire who are specially trained to mediate for you. 11. Finally, remember that you are the parent. No one knows what is better for your child, loves him/her as unconditionally as you do, or has his/her best interest in mind and heart. Never underestimate yourself or your ability to advocate for your child! Our children may have unique limitations, delays in learning, emotional and behavioral struggles, and any other myriad of mountains to overcome, but given the right support, encouragement, and education tailored to meet their individual needs, they can be over-comers with amazing potential. It is our job as parents to help them attain it. Tara Bertic is a homeschool mom of two adults and two teenagers. She and her husband John live in Tampa, Florida. It is Tara’s passion to encourage other ASD parents through her transparency in sharing details from their own story…the good, the bad, and the ugly. She recently published her first book on Amazon Kindle titled, The Rainbow-Colored Grass on Our Side of the Fence. Tara is a homeschool mom with four teenagers. She and her husband, John, live in Tampa, Florida. It is Tara’s passion to encourage other ASD parents through her transparency in sharing details from their own story…the good, the bad, and the ugly. She recently published her first book on Amazon Kindle entitled The Rainbow-Colored Grass on Our Side of the Fence. To learn more about Tara and her family, visit www.rainbowcoloredgrass.com.